New Delhi, August 10: Honoring the 89 freedom fighters from across the country at Rashtrapati Bhavan on the 76th anniversary of Quit India Day, the valuable contribution of the freedom fighters during the freedom struggle of India against the British rule will always be cherished and remembered. 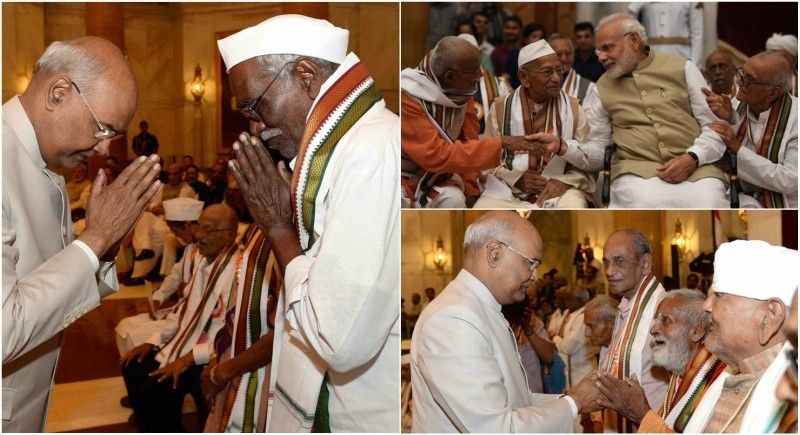 Felicitated by the President Ram Nath Kovind, the freedom fighters were honored in 'At Home' reception at Rashtrapati Bhawan. The event was attended by Prime Minister Narendra Modi, Union Minister of Home Affairs Rajnath Singh, and other dignitaries. Interacting with the freedom fighters, PM Modi said that their valuable contribution to the nation would always be cherished. Turning pages of history, India pays ode to the speech that inspired the entire to give it’s all for Independence “Here is a mantra, a short one. You may imprint it on your hearts and let every breath of yours give expression to it. The mantra is: ‘Do or Die’. We shall either free India or die in the attempt” by Mahatma Gandhi urging people to fight for their soil, their country. Celebrating the 76th Quit India Movement, India recalled the legends who gave their all with the mantra to never give up. India bows respect to all the freedom fighters and the unsung heroes who fought for the country.